It looks like Microsoft is continuing to work on its oft-rumored Surface Phone, with code found in the newly-released Windows 10 17672 SDK making reference to a “Factory OS Andromeda Device”. The code, which was found by Twitter user WalkingCat, suggests that not only is Microsoft working on the Surface Phone, but that progress could be quite advanced, perhaps with a final version of the hardware ready to be tested internally. Of course, a lot of this is guesswork based on some lines of code in Windows 10, but for many people the prospect of Microsoft continuing to work on a smartphone/laptop hybrid, and fully realising Windows 10’s mobile ambitions, is an exciting one. The Andromeda OS that the code refers to is an upcoming version of Windows 10 that will be a modular operating system, allowing Microsoft to add or remove features that are tailored specifically to the device the software will be running on. This follows rumors we’ve heard that the Andromeda OS would be aimed at mobile devices initially – such as the Surface Phone. According to the code spotted by WalkingCat, Andromeda OS will support both ARM and x86 hardware. ARM hardware is usually low-powered mobile devices, while x86 is more common computing components. It looks like the Andromeda Device mentioned in the code will be an ARM device, another hint that it could be a smartphone. The code also mentions WindowsCoreOS, a version of Windows 10 for IoT (Internet of Things) smart devices, and Polaris, the desktop interface that the OS will run. 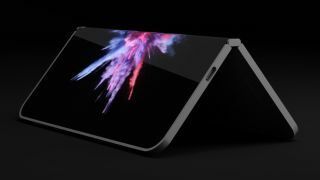 We’ve heard nothing concrete from Microsoft about the existence of the Surface Phone, but the rumors we’ve seen so far makes it look like it could be a very interesting device, if it does actually exist. If it does, let’s hope it’s more successful than Microsoft’s previous attempts to crack the smartphone market.